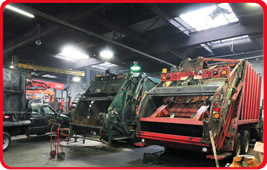 American Hose & Hydraulics provides quality hydraulic and industrial services in New Jersey and the East Coast. We are specialists and innovators providing quality and value in the Hydraulic field. When you need an unusual hose or hydraulic part immediately, call American Hose & Hydraulics. We Provide a wide selection of hydraulic hose types and hose materials from rubber, metal, specialty chemical to general purpose housing. We service and repair & manufacture hydraulic cylinders in our own facilities located in New Jersey, New York, and Connecticut. Our hydraulic technicians carefully check that the tolerances are exact and precise as the hydraulic pump or valve is prepared for reassemble and shipment. American Hose & Hydraulic manufactures and stocks a full line of replacement parts and accessories for the trucking industry. Our hydraulic machine shop service includes fabrications, repairs of parts, structures and components for heavy equipment. American Hose and Hydraulics provides welding shop services for hydraulic parts and machines for the East Coast. We Provide a wide selection of hydraulic hose types and hose materials from rubber, metal, specialty chemical. We provide pickup & delivery on all hydraulic parts and offer a year warrantee on our services.